Although my week has not been boring in some ways. I have kept updated on what is happening around the world and I have been motivated to pray. Maybe that is another reason I am tired: It takes energy to care and to pray. Earlier this week–maybe about Wednesday–EJ stopped at the gas station on his way home from work. He also picked up some fried chicken. When he got home, we three gathered around the kitchen table and had a fun midnight snack. Usually I like to prepare my Shabbat meal on Friday morning, but Friday morning was going to be busy so I prepared everything on Thursday. I made Ground Beef Wellington with Fennel. The recipe calls Pillsbury Crescent Rolls, but I made homemade crescent rolls instead, and I used the fennel that I grow in my herb garden. I also made Challah Bread. This time I braided with six strands. I’m always amazed that I can make such beautiful bread. It is such a work of art. When I was waiting for bread and crescent dough to rise, I took Danny for his regular walk. 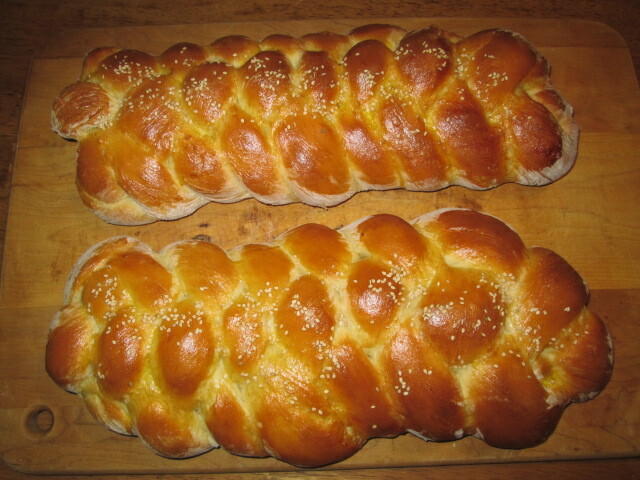 Before we began our walk, I took last week’s Challah bread out to the feeders for the birds. We don’t always eat it all and I hate to throw it away. Danny loves the bread too, so I broke off a piece for him before I gave the rest of it for the birds. At the end of our walk, Danny wanted to go through the gate into the yard where the feeders are. He NEVER asks to go into the yard after our walk, but he had taken note that I had taken the bread out to the birds, and he remembered. I unhooked his leash and let him into the yard, but the bread was all in the tray feeders where he couldn’t reach it. He is such a silly dog. At the beginning of our walk, my neighbor asked if I’d like some cucumbers and zucchini. She had extra from her garden. Absolutely! She brought a bag of them over not long after Danny and I returned home. I used the zucchini to make another mock apple pie. EJ and JJ (and I) love it and can’t get enough of it. My guys say they like the zucchini pie even better than real apple pie. When I finished all my cooking and had washed the dishes, I spent the rest of the afternoon doing financial stuff–reconciling the checkbook and all that. This is my most detested chore, but it has to get done. Friday morning we had to get up early to drive to the Cancer Center for JJ to get his port flushed. The port has to stay in for at least a year in case it is needed again [shudder]. Every other month, it has to be flushed. JJ enjoys seeing all the oncologist staff, but he hates going to the Cancer Center. Seeing all the hairless patients dozing in their chairs while chemo drugs are dripped into their bodies is like being sucked back into a nightmare. The days we go to the Cancer Center are very traumatizing days for him. EJ and I spent this morning studying together and discussing what we’ve studied. I also chatted on the phone with a very delightful friend. Then I took Danny for his walk. The day has been very enjoyable. EJ and I were just talking yesterday about how many Jewish people are Nobel Peace Prize winners, etc. We wondered if part of the reason was that they took a day each week to rest their bodies and minds. Shabbat really is a gift to look forward to. Here is a link to the recipe that I use to make zucchini pie. It really does taste just like apple pie. I wondered if there would be a difference in measurements between our countries! It is interesting that you use a scale in your country. I think the differences in countries are fascinating. Six cups means six cups and not six zucchini. Zucchini can be different sizes but a cup is always a cup (8 ounces) 🙂 Basically, though, you need enough zucchini cup up to fill a pie.